As we've mentioned elsewhere, first edition means the first printing of a book. Edition and printing can be used fairly interchangeably in talking about collectible books, especially in regard to modern fiction. For the most part, the first edition of a book is more meaningful to the world of book collectors than it was to the publisher who printed it. That's because the first printing only represents a portion of the total number of copies of a book that the publisher hopes to sell. That first printing is just an installment on what they hope to be a long term investment in that book. The first printing of a book might contain a few thousand copies. As those copies are shipped out to bookstores and sold, publishers will start a second printing to meet consumer demand. Because most publishers aren't typically in the business of trading in rare and collectible books, they haven't necessarily had a strong reason for a unified and consistent way of identifying first editions. Professional booksellers and dedicated collectors spend time collecting knowledge and resources on what a particular publisher might use to identify the first printing of a book. Each publisher has their own conventions for what they use to tell the first printing of their books, and to further complicate matters, they tend to periodically change what they've been doing from time to time. The specifics of a identifying a particular book's first printing often benefits from the use of reference books, but there are some basic things to look for. Typically, you will want to start with the copyright page as a first glance into a book's lineage. That page is usually on the verso of the title page. 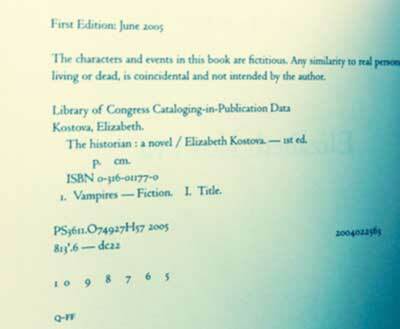 Publishers will often use one of a few methods for showing where that copy falls in the printing history of that book. A number line might show the printing and sometimes the year of publication. The idea here is an elimination game. In most cases, the first number on that number line indicates what printing that copy was a part of. With each printing, the publisher removes a number from the line of numbers. The lowest number on that line often indicates that book's printing number. 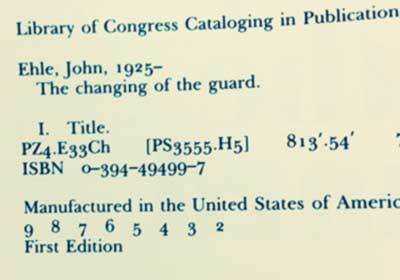 Harper and Brothers, one of the many incarnations of the modern day HarperCollins publishing house, used a unique two letter code between 1912-1922 that indicated the month and year of publication. The first letter, A-M indicated the month, January-December. The second letter, M-W, indicated the year, 1912-1922. In some cases, a number is moved from the left side of the line to the end of the right side as that printing is exhausted. Another variation is printing number and year of publication. One side of the number line is the the printing number, the other side is the year of that printing. Numbers and years are removed as the book continues through its course of sales. The left side of the number line indicates the years of publication and the right side the printing number. The lone 'e' floating on this page means a fifth printing of this book. The incomplete number line (10 9 8 7 6 5) in this example tells you that it is a fifth printing of that book. Sometimes the word "First Edition" will helpfully be printed on that page, often described as "First edition stated" by booksellers. "First printing", "First Impression", and "First Published" are other ways of publishers stating the first edition. That bold declaration can't always be taken as authoritative, though. 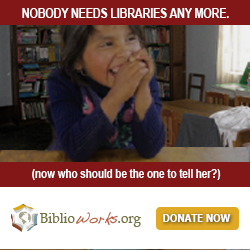 If the word First Edition is on the page with a number line, that number line must be complete. This means that the first number in that line of numbers must start with the first number for that publisher. In most cases, this is predictably a '1', but in one famous example of the arcane nature of publisher's methods, Random House between 1970 and 2002 began their number lines with a 2 on their first editions that included a number line. Counter intuitively, a 1 in the number line for that publisher during those years meant a later printing. Random House between 1970 and 2002 started number lines with a 2 to indicate the first printing. The printing history page is the first thing to check, but not the last. In some cases the printing history may show everything that you could hope for, but other parts of the book contradict that story. Reprint houses (EG: Sundial Press, Triangle Books, Grossett and Dunlap) would sometimes purchase the original printing plates from the original publisher. 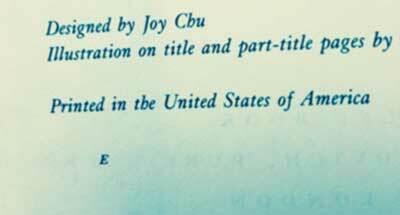 Their reprinted edition would potentially bear all of the same edition identifiers on the copyright page. The test here is to compare that copyright page with the information on the spine of the book. Typically, the reprint house would label the tail of the spine with their company name. If the copyright page tells you that the book is a first edition from William Morrow and Company, but the spine of the book tells you that it was published by Walter J. Black, you probably don't have a first edition. Advanced review copies and other pre-production copies of a book may also share all of the printing history details as the first edition, but the cover of these editions almost invariably will state that it is an advanced review copy or galley, or something similar. While these pre-publication printings are technically first editions, they tend to have limited appeal to collectors, so they generally aren't the first edition that collectors seek. Much the same as reprint houses, book clubs will reproduce the entire book without any changes, and that reproduction includes the printing history. Book club editions can usually be identified as such by one of a few tell-tale signs. In most any hardcover modern work of fiction, the dust jacket has a price in the front flap. If your copy doesn't have a dust jacket to compare by, there are other ways to potentially tell it it's a book club edition, but without the dust jacket, it's value is probably pretty limited regardless of whether or not it's a first edition. For many decades book clubs would mark their editions with a blind stamp or colored deboss on the tail of the back board, near the spine. That little mark is a sure sign of a book club edition. Not all publishers make specific mention of the first edition. In some cases, no indication to the contrary is the way that you can tell the first printing. Book collectors expresses this as "no additional printings." This simply means that the copyright page of a book is free of any number lines beginning with a 2 or statements to the affect of "Second printing." Viking Publishing used this method during the 1980's, for example. Every once in awhile, you may run across a book that states that it is "Second printing before publication." That statement informs that the first printing of the book ended up not meeting the initial bookstore orders before the book went on sale to readers. That particular statement is something of a boast from the publisher, telling readers that the first edition sold out before the book was ever even released. The statement "Second printing before publication" really just means that the book is a second printing. The first printing is the first edition. Once you have some level of confidence that your book is a first edition, you may be faced with a question of state. Some books went through some subtle but significant metamorphoses mid-print run. As the first printing/first edition was being printed, some change would occasionally be introduced. Sometimes this was a matter of catching a typo or missing page, or sometimes the change was even more practical, such as switching the color of the cloth on the binding as the supply of one color ran out. Since the goal of the book collector's interest in the first edition is getting as close to the original source as possible, almost invariably, the first state is the most valuable copy of the first edition. The changes in during the production of the first printing are called "states", so you may see a book described as "First edition, first state". That indicates that the copy they are offering is the earliest example of that commercial production. The identifying characteristics of changes in state are called "points of issue". Those points of issue are the specific misprints or changes. For example, JD Salinger's Raise High the Roof Beams, Carpenter, and Seymour: an Introduction went through three different states in the first edition. The earliest state lacks the author's dedication page. That mistake was caught fairly quickly. The printers fixed that error by tipping in the missing page, creating the second state of the first edition. The initial error was fully addressed later in that print run when the missing dedication page was printed and bound into the book, creating the third state of the first edition. All three states are first editions, but the 1st state sells for around $5,000. The second state comes down precipitously to around $300 or so, and fine copies of the third state of that first edition for even less. The knowledge that booksellers accumulate on the specifics for determining first editions takes years to build, and constant exposure the books themselves, but amazing, comprehensive resources are available to speed things up a bit. McBride publishing has been printing their indispensable A Pocket Guide to the Identification of First Editions and Points of Issue since 1996. These tiny, unassuming looking little guides carry a wealth of information compactly presented. Edward N. Zempel and Linda A Verkler's First Editions, a Guide to Identification: Statements of Selected North American, British Commonwealth, and Irish Publishers on Their Methods of Designating First Editions offers a fascinating view into the arcane traditions of publishing by quoting each publisher on their methods for designating their first editions.